Served with chips or substitute a cup of soup or chili for $1.49. Our homemade meatballs served on grilled Italian bread, topped with onions, our spaghetti sauce, and melted Italian cheeses. Pepperoni, salami, ham, turkey, tomatoes, cheese, and Italian dressing, oven baked and served on grilled Italian bread, then dressed with mayonnaise and lettuce. Your new favorite sub! 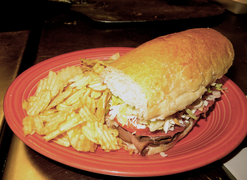 Your choice of two meats and any other vegetable toppings, dressed with garlic butter, tomatoes, cheese, lettuce, mayonnaise, and Italian dressing on our homemade Italian bread. Your choice of three meats and any other vegetable toppings, dressed with garlic butter, tomatoes, cheese, lettuce, mayonnaise, and Italian dressing on our homemade Italian bread. Pepperoni, salami, ham, turkey, tomatoes, lettuce, cheese, mayonnaise, garlic butter, any other vegetable toppings, and Italian dressing on our homemade bread. Pepperoni, salami, turkey, ham, roast beef, lettuce, cheese, tomatoes, onions, pickles, green olives, black olives, banana peppers, green peppers, and jalapeno peppers. Cold subs are not available heated. Thank you.